The Sharp GX40 is get to be announced by Sharp, but we believe that it is partly based on the Japanese Sharp V602SH handset (pictured). We anticipate that the GX40 has a 2.0 megapixel camera, possibly with optical zoom. We also understand that the GX40 will have a 320x240 pixel display in 262,000 colours, SD memory card expansion and Bluetooth. It's not known if the GX40 will have the same swivelling display as the V602SH, although this is a feature of the new 802 and 902 3G handsets, so it's quite likely. The GX40 is likely to be quite a large phone, probably weighing around 125 grams, and with about 3 hours talktime. 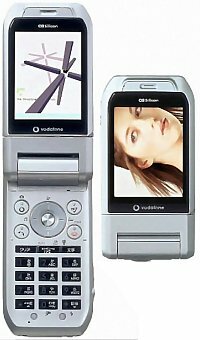 The official announcement of this phone is sometime after November 2004. Please subscribe to our newsletter for updates. If you want more information on the Sharp GX40, subscribe to our mailing list. Also, the Update newsletter contains general news about new phone releases.